2BR/2BA Gulf Front Condo from $129.00-What a Clam Good Deal!! THE BEST VALUE ON THE ISLAND!! Talk directly with us, the owners. We are not a management company working for the owners and getting a commission. You literally save $$$$ when renting directly from us. 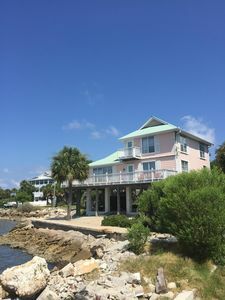 Whether it be for a 2 night stay or a 2 month stay, we want you to enjoy our condo, all its amenities and the 'Old Florida' lifestyle that Cedar Key and its surrounding areas have to offer. 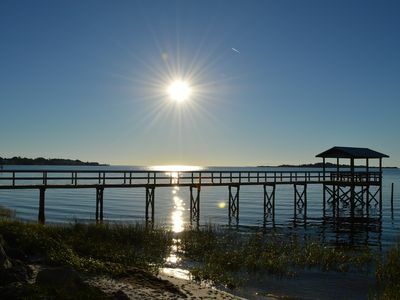 Did you know that Cedar Key is the #2 producer of farm raised clams in the U.S.? So... Kick Back, Relax and Have a CLAM GOOD TIME!! Step back in time to a place with no traffic lights; no fast food; no big box stores or malls. 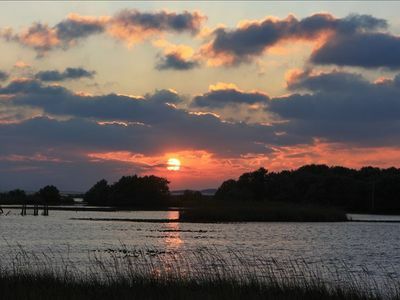 Park your vehicle after your trip to Cedar Key and forget about it until you go home. 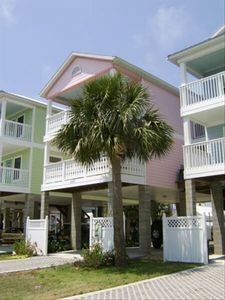 Everything in this 'Old Florida' style fishing village is within walking, bicycling or a golf cart ride away. That's right--Golf Carts almost outnumber the amount of cars riding around the Island. On the Island, enjoy the 2 Museums; City Park, Playground and Beach; Shopping; Gulf Front Dining and Fishing off the BIG Dock. Being on the west side of the island, our condo allows you to see THE BEST SUNSETS ON THE ISLAND in any season. Also off in the distance you will see small planes take-off and land from the local airport. Picture in your mind a plane landing at sunset from your private balcony and you will see why we have a picture of that in our unit. Awesome! Our 2nd floor condo comprises the entire floor of the building so no one is directly next to you on either side and has a split bedroom/bathroom plan that allows for maximum privacy. 1 BR/BA on one side with double sinks and bath/tub combo and 1 BR/BA on the other with single sink and shower. Both open seperately to kitchen/dining and living area. The kitchen is equipped with all FRIGIDAIRE appliances with refrigerator/ice maker; dishwasher and a smooth top range and above counter microwave. It is fully equipped with all utensils, plates, pots, pans, glasses, small appliances and any gadgets you could need. Full bar accessories on site. Your private 30 ft balcony has a pub height table with 4 swivel chairs to enjoy your favorite beverage, snacks, appetizers and breakfasts or for dinner and the romantic sunsets. You can also watch the dolphins put on a show; clammers checking their crab traps; shellers picking up sand dollars at low tide. If that's not for you or the weather isn't cooperating you can always 'hang out' at the counter top height dining table and island in the kitchen. We recently chose to change to the counter top height table from the regular dining table height because it gives you more of a gulf view. We like that and hope you do too! 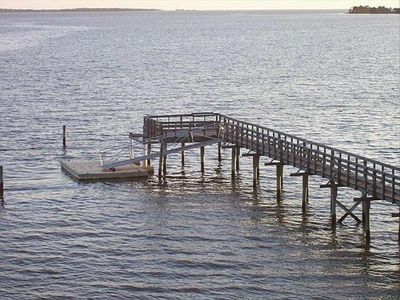 To get closer to the water, walk the 100 ft pier leading to the private boat dock and fish cleaning station. There is a 'sunset' bench on the pier for those special moments and photos. Our unit is close to the 30' x 20' oval shaped pool and 10' diameter in-ground spa overlooking the Gulf. 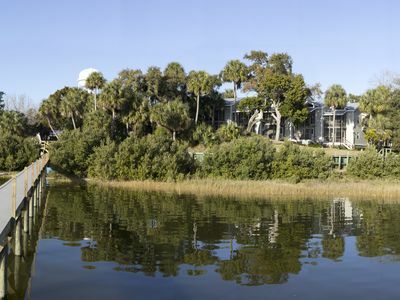 If you want adventure off the Island there are Manatee and Homosassa Spring State Parks; Kanapaha Botanical Gardens; Cedar Key Scrub Preserve; Ancient Shell Mound; Suwannee River and Steinhatchee all within an hour or less drive. 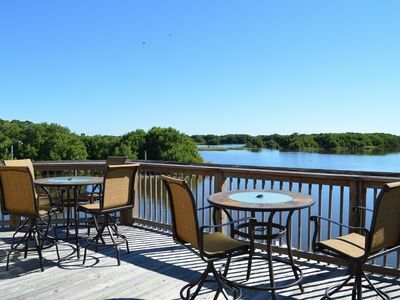 We're here to help your stay in Cedar Key become a memorable experience so that you will want to come back again and again. Give us a call to make that happen! We hope you have a CLAM GOOD TIME!! 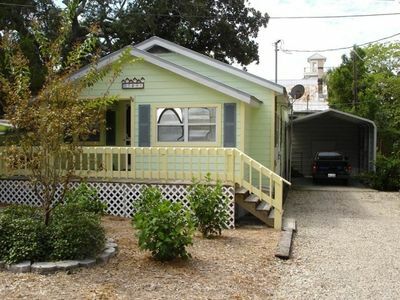 Seashells Cottage in the Heart of Cedar Key!!! 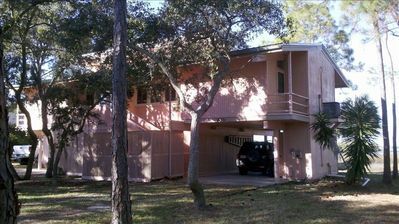 Shore Leave - Gulf Front, Great Accommodations, and Privacy. 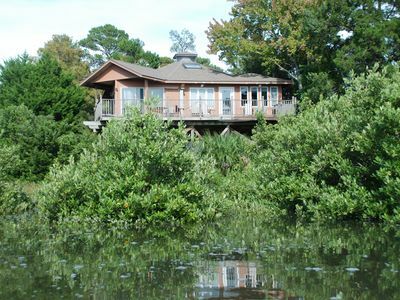 Ida Belle Cottage--Boat Ramp, Restaurants, Shopping Within One Block!